I was plowing through a pile of East German miniature sheets the other day, not expecting anything much of interest, to be honest, but I was pleasantly surprised! After having sorted them and put them in my stockbooks, I realised that there were quite a few nice ones among them. 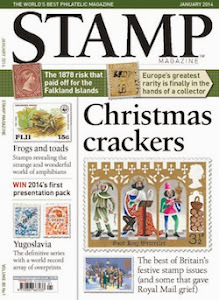 Especially those tiny ones with just the one stamp included were quite smartly done. I think they were mainly prevalent in the 1970s and 1980s though I have a few later ones and there may well be earlier ones too. Some are very East German in nature, such as the one shown above. It marks the 30th anniversary of the German-Soviet Friendship Society, in 1977, and the design has the obligatory flags and symbols and predominance of the colour red which we all associate with that period and that part of the world. Others, like this slightly more recent one from 1979, are just very much German in nature. This sheet was part of an issue to promote the National Stamp Exhibition in Dresden. It reminds me very much of the Tourist definitives that were introduced in West Germany and Berlin in the 1980s, though these were designed by others. 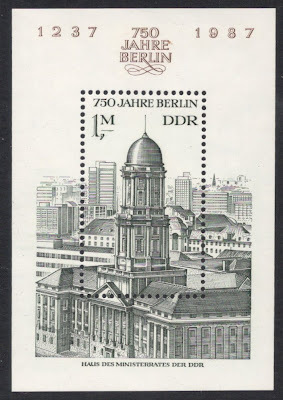 The designer of this particular sheet, Joachim Riess, went on to design stamps for a united Germany as well, that way spreading his specific design style all over the German catalogues. 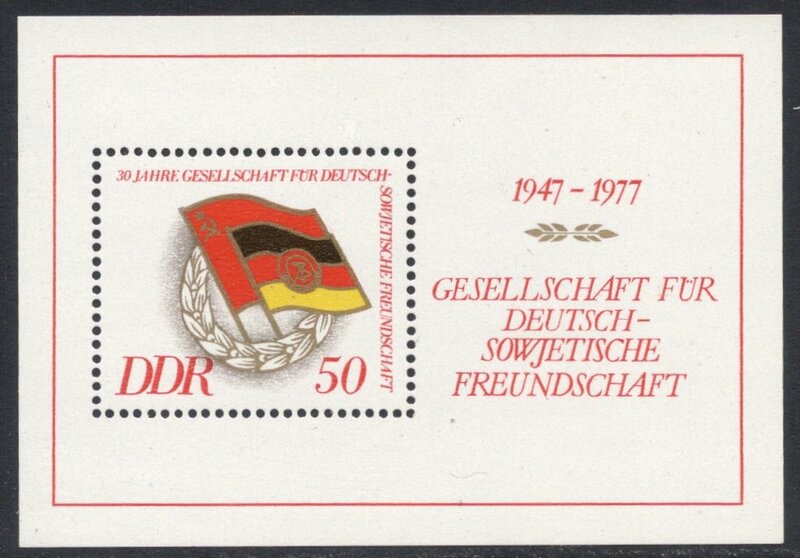 Quite a few of these small miniature sheets were dedicated to the great and good of Germany. 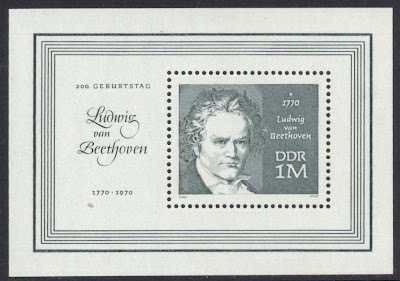 Beethoven, for example, was honoured with a miniature sheet in 1970 to mark his birth bicentenary. The design is still a bit bland, but the fact that it is recess-printed makes up for that. Later miniature sheets managed to utilise the space around the stamp better, to add to the thematic importance of them. 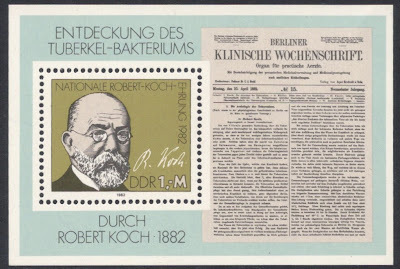 In 1982, for example, on the miniature sheet for the centenary of Dr Robert Koch's discovery of the tuberculosis bacillus, we not only find the doctor on the stamp itself but the medical journal in which he writes about the discovery depicted on the sheet, thereby enhancing the whole thing no end. 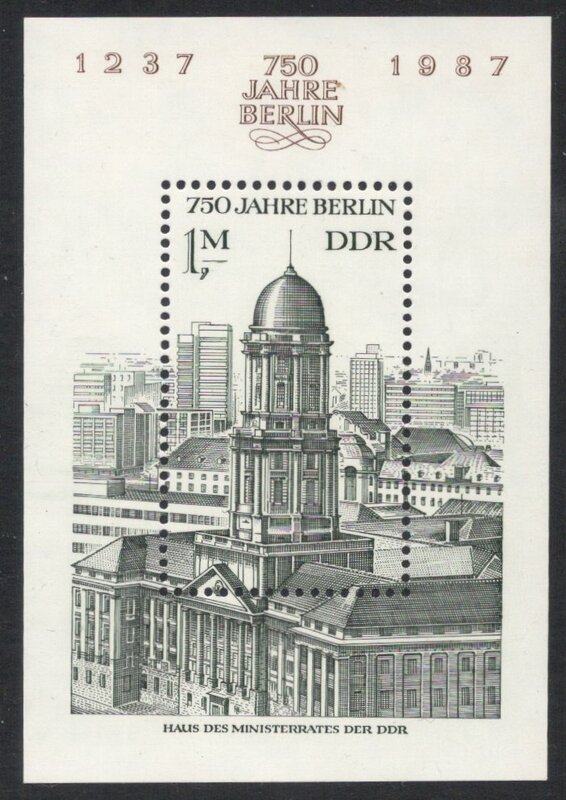 As East German stamp design became less 'Eastern-Bloc-ish', its miniature sheets went along on the ride, and this one from 1986, marking the upcoming 750th anniversary of Berlin, is a good example, I think. Although I must admit I prefer them in landscape format. 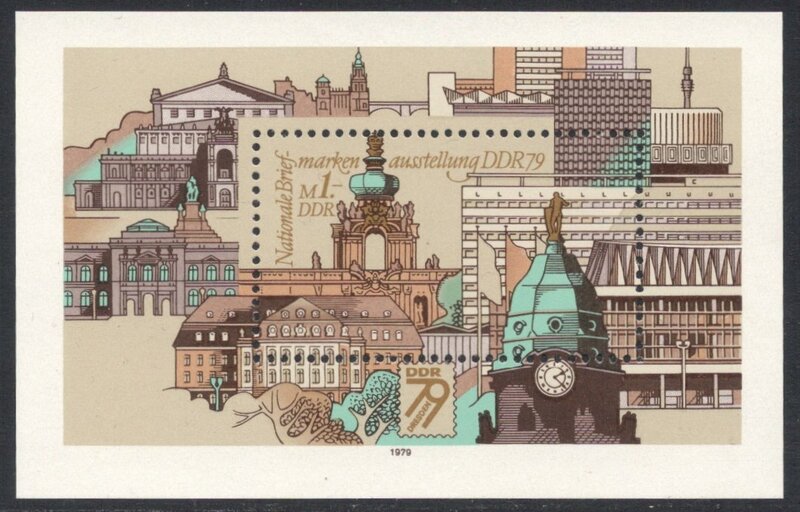 But this one is printed in recess, of course, which immediately gives it a classy feel, and the design shows off the architecture in a grand way, with loads of empty spaces and the more modern buildings receding into the background. 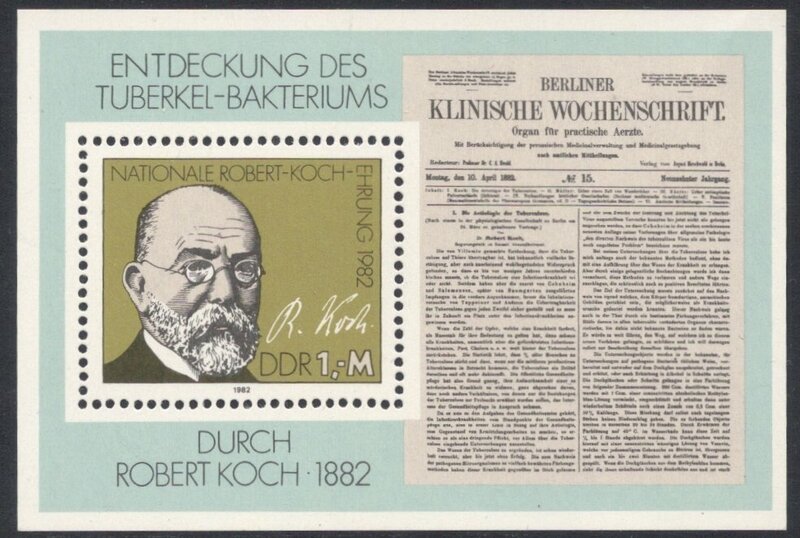 So it was great to find that once again, even in the most unexpected places within the world of philately, there's something interesting to discover! A blast from the past with these. I grew up in West Germany during the Cold War (1970s) and can well remember these miniature sheets being on sale in the local German 'Kaufhof'. As a US Army brat, these were pretty 'cool', coming from 'the other side of the trace' as it were. I remember that I bought some Soviet - GDR Friendship MS and the like. The hammer & sickle and hammer & compass symbols had an appeal to a kid growing up within that environment. I recall that they were fairly cheap, mostly costing DM 2 - 5 each. The quality, however, wasn't as good as the West German MS. Funny to think that the GDR, once a source of anxiety for the US military, is a 'dead country' nowadays.